An API Use Report describes a set of references from one set of bundles to another set of bundles. A report can be generated using the API Use Ant Task. A user interface is provided to configure and generate a report in the External Tools dialog. To create a new use scan configuration simply double-click the API Use Report configuration type. The API Use Report tab allows you to configure the analysis. The following example shows a configuration to extract all references to Eclipse bundles in a 3.4 installation. Analyze > Baselines... 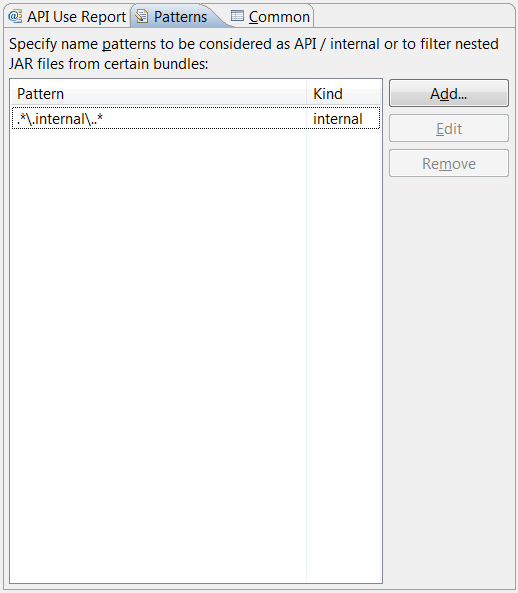 Allows access to the API Baselines preference page to configure the baseline to analyze. Analyze > Targets Allows access to the Target Platform preference page to configure the target definition to analyze. Analyze > Browse... Allows you to browse for a folder of bundles to analyze. 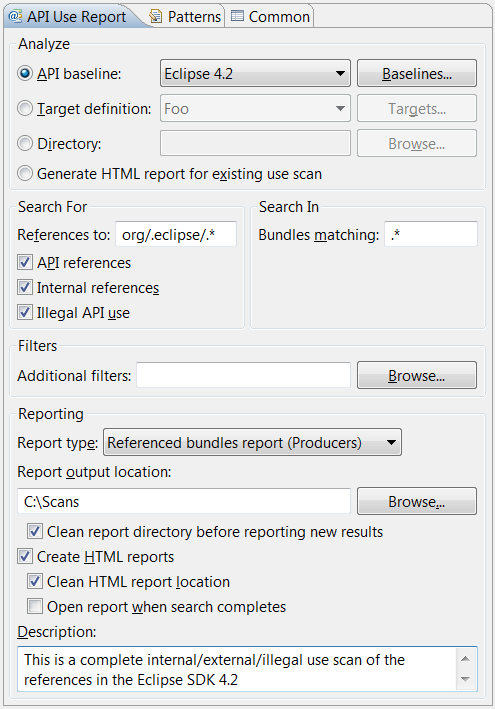 Analyze > Generate HTML report for existing use scan Allows you to create a report for an existing scan and not have to perform the analysis again. Filters > Additional Filters Allows you to specify a directory of API problem filters to use during the scan. The setting is the root directory of the .api_filters files that should be used to filter potential references found by the use scan. The root is specified using an absolute path. Reporting > Report Type Allows you to choose between two html report formats. If Referenced bundles report (Producers) is selected the report will list all of the bundles containing the types that are being referenced in the searched bundles. If Referencing bundles report (Consumers) is selected the report will be organized to show all of the bundles in the search scope that contain references. When switching report types, check that the References to and Bundles matching regular expressions have the correct values. When using a wildcard expression such as . * in one setting, switching to another report type often requires the wilcard being moved to the other setting to get the most useful report. Reporting > Browse... Opens a dialog where you can select the location to output any reports. Archive Pattern - Allows you to specify nested archives that should be ignored during analysis. Package Pattern - Allows you to specify packages that should be API or internal without having to update your bundle manifest. Report Conversion Pattern - Allows you to create a package name regular expression to filter references taht are reported. All reported referece are filtered using their fully qualified package name. Add... Allows you to add a new pattern. This button will start the Pattern wizard. Edit Allows you to edit the currently selected pattern. Only one pattern can be edited at a time. Remove Allows you to remove the selected pattern(s). You can remove more than one pattern at a time.